At the end of each semester, Salt Lake Community College students have the opportunity to offer honest feedback about the courses they take. Course evaluations open two weeks before the first day of finals and close two days after the last day of classes. According to Jeffery Webb, Director of Institutional Research and Reporting at SLCC, these reviews can be used to measure different dimensions of a course, including the quality of instruction. “The purpose of course evaluations is to give teachers direct feedback on the quality of a course so that they can make adjustments in their approach, if necessary,” he says. Webb says additional benefits of course evaluations for teachers include work recognition and identifying strengths. 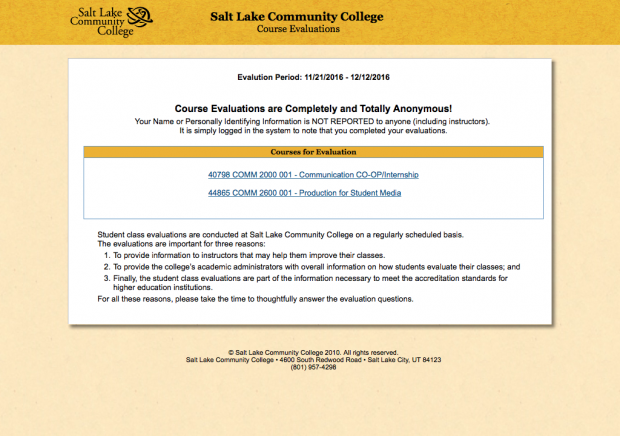 Most teachers at SLCC choose to view the evaluations as a source of positive criticism, as they are also allowed to submit questions to be answered anonymously by students. “The anonymous feedback from the course evaluations helps teachers master content, refine their teaching skills as well as analyze their own performance and implement changes needed to improve learning and teaching,” he says. Webb explains that the evaluation system is a custom-made application, and since each faculty member is required to go through an evaluation process, the system helps deans and chairs assess their faculty in a relevant way. Students have until Monday, Dec. 12 to log in to MyPage to complete course evaluations for the fall 2016 semester. Contact Debbie Mahre at 801-957-4732 for more information.